The ReactorPanel ® saddle is a modification of Military saddle designs using hi-tech materials. The original design has been significantly refined using modern materials to produce a traditional looking saddle that is almost infinitely adjustable. The ‘panel part’ of the saddle is independent from the ‘rider part’. So it is possible to provide a saddle solution for the small rider partnering an extremely large horse, or vice versa; with ReactorPanel ®, both parties can achieve the perfect fit – over and over again. In a well fitting ReactorPanel ® saddle most horses visibly relax and the stride lengthens. Riders trying them for the first time feel the freedom of movement immediately. 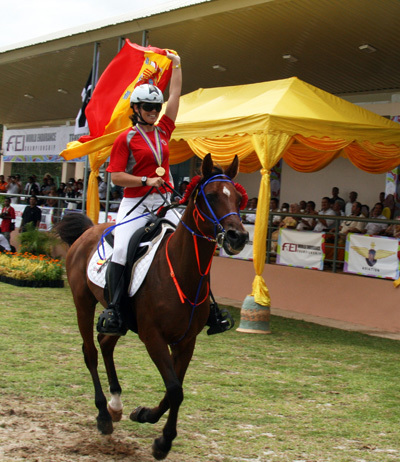 Particularly in extended trot, they also experience a close connected feel with superior stability and feel at one with the horse . Horses who previously struggle going downhill or achieving the correct leg in canter find that everything is easier, in fact aids can be refined as the horse becomes more sensitive to them. 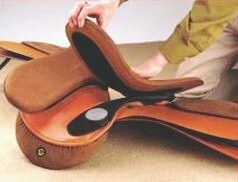 This is because the large flexible panels maximize the weight-bearing surface, distributing pressure over the widest possible area so the horse carries the saddle more comfortably and the riders feel more stable, the close contact feel that is achieved enables the horse to feel weight and seat aids the rider in a more clear way. Different panel lengths ensure that the system can accommodate horses of all shapes and sizes on different size saddles, the object being to spread the riders weight over the largest weight bearing surface possible . The panels are made of a sandwich composition of leather, hi-tech foam and plastics, which creates their weight distribution ability. Although the panel appears forward to customer unused to looking at panel saddles, the flexible design allows for more freedom of movement, resting over the scapula or shoulder blade (this part of the panel is non weight bearing) it allows the shoulder to travel backwards underneath the panel allowing complete freedom of movement. The tree points are specially shortened to end above the bony mass of the scapula so when the shoulders rotate backwards, they slide easily under the panels without encountering rigid resistance. This feature is especially useful with regards to horses with muscle damage to the wither pocket or high withers as the saddle does not sit into the area behind the scapula as does a traditionally designed saddle which is very advantageous to the renewal of muscle in these cases. The specially designed numnahs and saddle pads come in a pair, one for each panel, they are attached independently of each other and ensure that as the panels move with the horse there is no constriction at the top of the wither or movement from the numnahs. The connection between the saddle and the panel is made with four shock-absorbing ‘Sorbothane’ discs. Sorbothane is a dense patented rubber designed to isolate vibration while absorbing energy and impact. The discs come in four thicknesses, allowing almost infinite repositioning to custom fit the saddle. The panels and shock absorbing discs follow the changing contours of the back in motion. The panels undulate with the back under the centre of the saddle. Independently attached, the panels compress and flex on either side of the horse’s spine in response to the back motion. For more information on this amazing, semi solid please see “Why Sorbothane? No other saddle has this system, absorbing shock and concussion from both the rider above and the horse below giving the ultimate in stability and feel even on the widest horse. You really can feel every footfall. The saddle moves with the horse’s back, flexing as the horse moves. Considering your saddle as a long term asset can assist in your decision. Buying a saddle that can be infinitely adjusted can save you money in the longer term. Few saddles will take your horse on a journey from the first day you sit on him until the end of your time together. A Reactor Panel® Saddle can do this, in most cases it can also be adjusted and refitted should you change horses and in cases where horses are a similar size and width it can sometimes fit more than one without adjustment, especially if they are of similar breeding. We all have great hopes for our horses but one cannot expect a horse to perform to the best of his ability unless his saddle fits him. However, to ride your horse to the best of your ability you, the rider, need to be comfortable and secure and the saddle must fit you too. It is surprising how much easier it is to look good on a horse when sitting on the right saddle! A ReactorPanel® Saddle offers supreme comfort and fit for both parties. From her base in Devon, Lucinda McAlpine, International Dressage Rider, works with an ever increasing number of riders from all disciplines Lucinda searched for years to find a saddle that would enable her Advanced Dressage horses to execute the difficult movements she asked of them. Having found RP saddles, she would not now ride on anything else. She says, “I work a great deal with young horses or horses undergoing rehabilitation and I consider my ReactorPanel® Saddles as invaluable tools – whereas a conventional saddle is just a saddle, this is an advanced riding device!”Lucinda often loose schools horses in her saddles to help them loosen up before training. Working with Saddle Exchange, Lucinda helped create the Lucinda McAlpine Dressage Saddle. The Lucinda McAlpine dressage saddle has been designed for a more classical riding position, the saddle holds your legs in the correct position. It is made out of Memel leather for the comfortable close contact feel. The knee blocks are large and adjustable to fine tune the fit to your individual riding needs. With our success in the Endurance Market Saddle Exchange Saddling Solutions added a new Endurance Saddle to the range in 2010, The Xtreme Endurance. This saddle is now being used by a number of high level, International riders together with the established Christine Yeoman Endurance Saddle, which have special features to enhance the experience of the endurance rider or our standard Endurance saddle used by Twice World and European Endurance Champion Maria Alverez Mercedes Ponton. These specialist saddles are not just the province of the professional rider; if they can help the professional, they cannot but assist the aspiring rider to reach their full potential. There is not a saddle produced that suits every horse but ReactorPanel® may be a good place to start. It could become an asset in your tackroom or as Lucinda McAlpine puts it ” An advanced riding apparatus” – a tool to be used for many years by you and your horse – or horses! Here’s what Christine Yeoman has to say about her saddle. in This video made in Denmark by Myhorse.Tv Dean explains the saddle and sets one up.